Watermanswebworld is the website for I. Waterman (Box Makers) Ltd . Since 1897, the company has maintained its position as one of the UK leading manufacturers of cardboard boxes, corrugated cartons and packaging. We design, manufacture and supply cost effective and innovative solution to satisfy almost every packaging requirement, across a broad spectrum of industries and marketplaces. Today, Watermans ( as our customers like to call us ) still remains an independent sheet board converting plant based in the heart of London. Our creative and cost effective solutions ensure that our customer’s, ever-growing expectations and needs are always exceeded, with quality and a level of service and reliability that is almost legendary. It is for this reason that the company has such a strong reputation amongst its vast portfolio of customers and within the industry in general. Clear customer focus and our versatile manufacturing plant provide our customers with the satisfaction and security that their demand can be fulfilled. We design, We manufacture, We deliver. 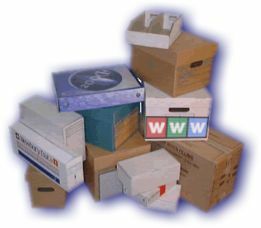 In addition to the manufacture of both large and small production runs, We have a large range of stock boxes for a huge variety of applications. Please contact us today and see how a century of experience can help you with your box and packaging requirements.